It’s more than just office space, it’s a thriving business community. Your neighbours will be everything from a recent start-up to a fully established business, it is a buzzing network awaiting you and your team. 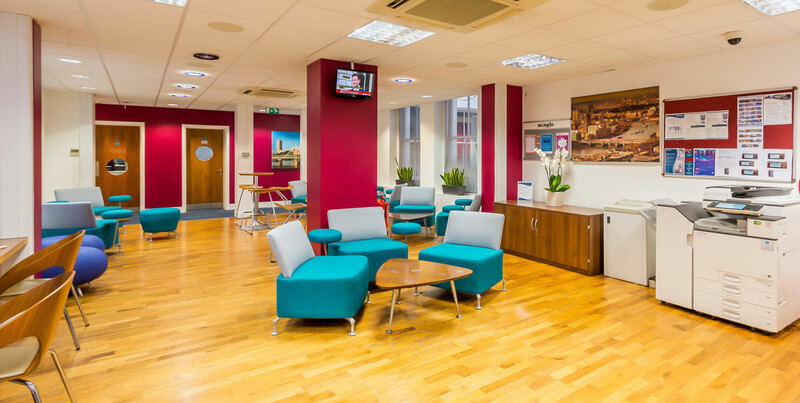 Our break-out spaces have comfortable chairs and free-flow teas and coffees so you can enjoy time away from the desk. Time away from your computer screen can be just as important as time at it. Whether it’s catching up with colleagues over a coffee, mingling with other clients or even just a few minutes of brain space, it’s important to have an area where you can get away from the hustle and bustle of every day at your desk. That’s why we’ve dedicated a large amount of space at every centre that’s just for clients to use as they wish. We don’t like formal networking events and pre-rehearsed elevator pitches – does anyone? However we understand the importance of creating a platform where like-minded business people can interact, discuss ideas and potential win business. That’s why we lay on lots of client events but don’t worry they are not the sort you need to practice speed networking. A typical event would be putting a major sports event on a big screen where we provide some beer and pizza – then networking takes care of itself! Social media is great but there’s time when grabbing a coffee with someone is a more effective way to interact. Throughout our centres we’ve installed kitchens with informal seating areas to allow you to grab a quality caffeine hit and a few minutes away from the daily grind. Everything is included in your monthly package and we occasionally lay on some specialist coffees for you try.